It has something to do with the light, the quality of it, the height of the sun at midday, the edging toward the equinox, the headiness of spring-just-around-the-corner. Painters like Kate can finally work deep into the afternoon. Cyclists start tuning up their bicycles. Gardeners get itchy. They order their seeds; they prowl the local garden centers, perusing the new varieties and bringing home those lovely seed packets that will stare at them for a couple of months. But me? I did that ages ago. When the seed catalogs fill my snow-covered mailbox in early January, I am so hungry for green that I spend a week planning the gardens. I order seeds, berry bushes, fruit and nut trees–whatever I need for the coming year. And so now? In March? Do I stare at all those seeds? Not a chance. I can’t help myself. I turn from all that beautiful daylight and head down into the basement to the glow and hum of artificial light- to plant the first seeds of the year: all manner of greens for windowsills and eventually for under the two tunnels out over raised beds that I’ve readied for early inhabitants. Planting while the snow still flies means I can get my hands dirty, smell the sweet soil, and dream of those early salads and spring combinations filled with the bright flavors and rich nutrients of mesclun and lettuces and other early greens right from my own garden. There’s really no better way to greet spring than with the first baby greens–the variety is amazing these days, as Eating Well points out in the Salad Greens Buyer’s Guide. 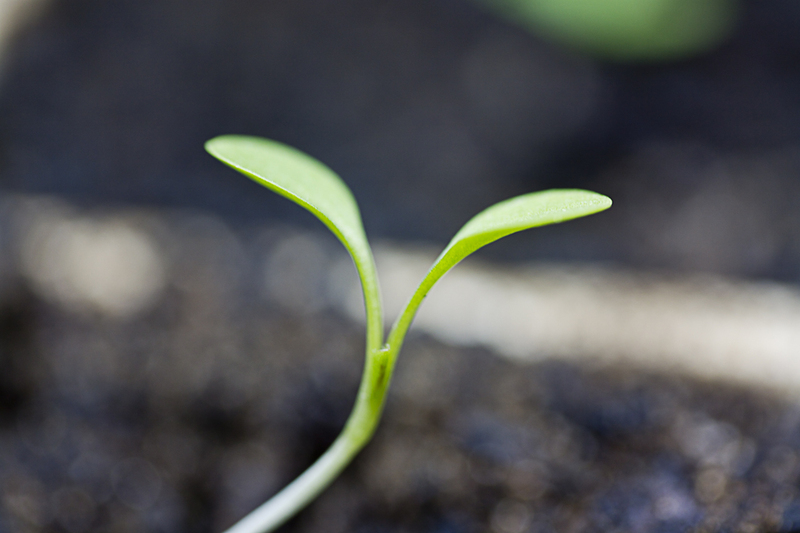 The first plants are up and growing steadily; they have their first real leaves–a sign that soon it will be time to transplant them to larger vessels. Some will live in fat pots in our big bank of south-facing windows, and some will go in small pots under the grow lights for a couple of weeks or so before moving to the garden tunnels as soon as I can be pretty certain the temperatures will not plunge below about 20º. Early lettuces keep giving for weeks. 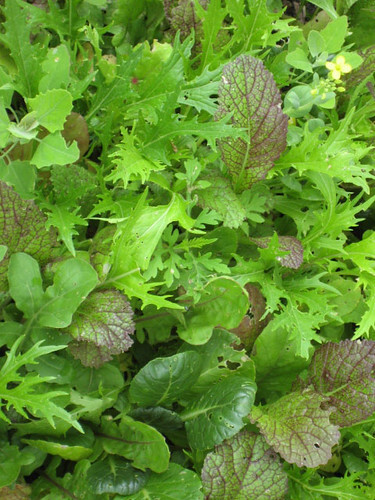 By harvesting just the outer leaves, or by snipping all but the bottom inch of the plants, you encourage them to send up new leaves–more salads to come. Tomorrow, I’ll plant fennel, onions and lavender, lemongrass, parsley, and artichoke seeds sent to me all the way from Sicily. Who cares if it snows all the way through March–I’ve got plenty of green to keep me heading into deep spring.